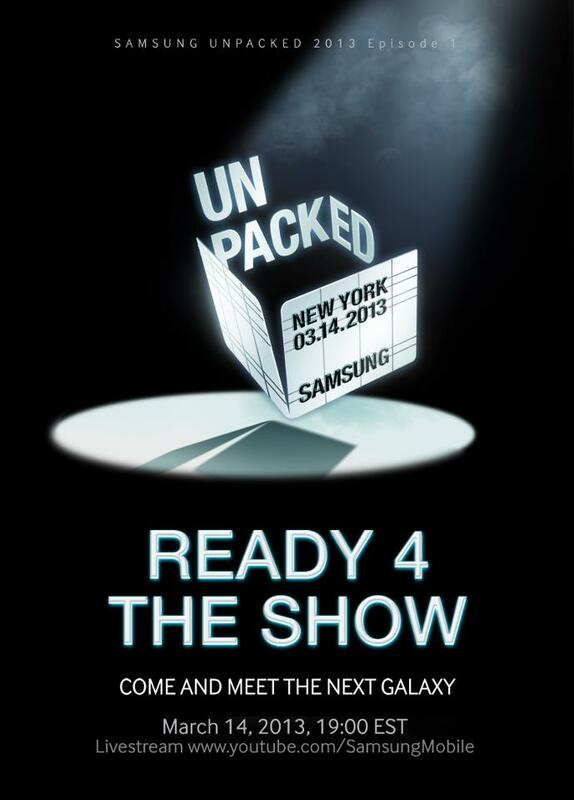 Samsung Confirms 14 March 2013 Unpack Event – Are You Ready 4 The Next Galaxy? And it’s official, Samsung has just officially announce that it will launch the Samsung Galaxy S IV on the previously rumored date – 14 March 2013. The teaser didn’t mention a specific device, it simply wrote if users are “Ready 4 The Show” and invited them to “Come and Meet the Next Galaxy”, so what else could it be other than the device most of you are waiting for. The Samsung Unpack event will be held in New York on the said date at 7pm EST. No further information have been revealed regarding specs but according to rumors, please take this with a pinch of salt, the Samsung Galaxy S IV will not be using its own Exynos processor or an AMOLED display. Instead, it was reported that Samsung will be using a Qualcomm Snapdragon 600 chipset with a CPU score of 1.9GHz; sorry for the disappointment, no octo-core for you, not yet at least. Other rumored specs include a 1080p SoLux display, 2GB of RAM, up to 64GB of internal storage, 13MP rear shooter, a non-unibody design, and finally a dimension of 140.1 x 71.8 x 7.7mm that weighs 138grams. So, will this announcement kill the HTC One before its arrival? Will you wait for the Samsung Galaxy S IV?